This is the team sheet for a crunch match against local rivals ! This page was added on 13/02/2011. That’s me in the team list,played gully.Remember Paul Shoemaker,Alan Edwards,Brian Hambleton and Peter and Paul Congo.We also played in the football and rugby teams.Memory serves correct also athletics and gymnastics.All thanks to Andy Templeton. I met up with Terry Collyer, ex-Puttenham Close, Warren Dell and Clarendon School, outside my hotel in Perth, Western Australia, for the first time in more than half a century!! He arrived, as arranged, on the morning of Sunday, October 13, in a smart blue Rolls Royce Corniche and we duly set off for a short tour of the coastal area south of Perth in glorious weather, before heading into Terry’s home town of Fremantle. He has changed little from the time I taught him Applied Maths and Cricket in 1962 and he was immediately recognisable! As an ice-breaker, I asked him exactly the same questions I put to him in that ground floor classroom (Morison Block) all those years ago: 1. Is your name Collyer? “Yes sir”, he replied! 2. Do you have a brother who goes to the grammar school in Watford? “Yes sir”. 3. Do you play cricket? “No sir”. Well, you do now! Practice sessions start at the end of term (April). He was to become a valued member of the school team over the next two years, although it’s fair to say that he did not take the game quite as seriously as his elder brother, Frank, who went on to enjoy an illustrious career with Hertfordshire. Frank’s achievements have been mentioned in detail in David Reidy’s book on the history of South Oxhey, “Poor but Proud”. It was a most enjoyable day spent with Terry Collyer and we were able to reminisce at length about times spent at Clarendon and on the LCC housing estate during the 1960s. I estimate that he is just one of several Oxonians who have settled Down Under since those days, some of whom have already made comments on this website. Hi Terry! I remember going to your leaving party at a hall in, I think, St Albans? I thought you were off to America but you seem to have kept on going! You might have been unable to play in the cricket match due to a cross country championship-you could certainly run! anyway, I ended up the headteacher of a lovely school in Oxford! able to play sports -although slowly- until I retired! I have recently received an email from John Swain, who will be arriving in Perth, Western Australia, on the 11th October 2013, where I have lived since 1971. I do not know why my name was deleted from the cricket team sheet and Melbourne inserted, I was later to become captain of the team. A further update on my sporting achievements, Cup winners medal playing for Watford School Boys, Football, Barnard Trophy, 1963-64, also cross country running, AAA’s Team Boys, 1964, Watford Relay, 1963. I am alive and well and living in Fremantle, Western Australia and soon to celebrate my 65th birthday in October, 2013. My, ye have been busy, Barry, Old Son! All those sporting memories, in addition to your exploits as a caddy at Hartsbourne. I was never tempted to gain employment in this way, but Peter Swain was always going over to Sandy Lodge and Moor Park from about 1959, and had several lucrative contracts with some of the more famous players. Elsewhere, I see ye were also involved in delivering the papers on Oxhey Drive in the mid-1960s: a great way to know the estate, to be sure. As I kept a record of every official cricket match I played in from 1953 until 1983, I’ve included the scores from the Staff-School cricket games 1962-66. 1. 1962 Clarendon School 21 all out; Staff 39-2 (Swain 33 n.o.) 2. 1962 School 86-9; Staff 87-3 (Swain 38). 3. 1963 Staff 122 (Swain 25); School 61. 4. Away in ROI. 5. 1965. No match. 6. 1966. School 61 (Swain 2-2); Staff 64-8 (Swain 23). The match ye refer to is probably the annual game with Watford Tech, where sandwiches were always provided courtesy of their Catering Dept! They used a pleasant ground in Hempstead Road, Watford, and I can remember last playing there for the Clarendon Staff XI in late June 1963, when we won by 9 wickets and I summarily finished the game with a six over square leg. Scores: Tech. 52-7; CS. 58-1 (Swain 41 n.o.). Perhaps that’s the occasion ye recall when Frank Crates took you back home. Finally, was the brilliant innings of 32 ye mention played in the 1963 match at Leggatts Way? Both sides topped 100 runs in each innings and Clarendon finished on the losing side by just two runs, despite the brave efforts of your good self and the tail-end exploits of the Congo twins!! A full match report, written by John Swain, was read out in School Assembly next day by the admirable Jimmy Storey, and this was followed by an impromptu round of applause led by headmaster, Mr.L.W.Stewart. Oh, Happy Days! I recall Terry being a great all rounder-good at all sports-no idea why he’s missing. Whilst everyone else got the bus to work in Watford, he would run there ( and back! ) I’m pretty sure he emigrated to USA in the early seventies. You mentioned the staff cricket team elsewhere, and this brought back the deep tensions that surrounded the staff-boys matches (only kidding) I have one , brief memory of a rugby match against the staff -Mr Hobbs ( great at basketball) hurtling down the slope on the lower pitch. Football is a bit clearer, Mr Teasdale scored the winning goal. Cricket-despite our best efforts , the staff won. Mr Brookes opened and played a dead bat with the odd swat, building a pretty good score for the rest of the staff to come in and belt the ball all over the ground. Boys happy as Larry but doomed to failure ( First Universal Law of Staff against Boys states “Staff win therefore boys lose”) When the staff were short (must have been the lesson preparation…) one or two of the boys played and I remember a lovely match somewhere up the Hempstead Road-all very social-sandwiches and a shandy, with a lift home from Mr Crates. Comment on golf elsewhere! I coached some of these players, as they also played in the Under 13 side, throughout the Summer Term of 1962. 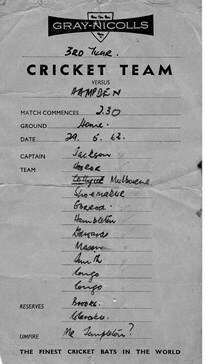 The team sheet appears in the inimitable hand of the late Andrew Templeton, former Head of Physical Education at Clarendon School in the 1960s, who died last month at his home in South Wales, aged 74. Even after all these years, I can still remember most of the lads listed, and I’m intrigued to know why Terry Collyer’s name has been deleted. He was the younger brother of Frank Collyer, who went on to become one of the outstanding sportsmen from South Oxhey. Frank’s story is to be included in the forthcoming social history of the estate, edited by David Reidy. Thanks Barry. I recall you as a fine pace bowler during your time at the school. Well Barry, I used Gray-Nicolls cricket bats in my own school/university/club career (1953-1983) and I had the good fortune to be given one from my parents for my 21st birthday in 1965. I was also the delighted recipient of a miniature bat presented to me by the Clarendon Under 13 cricket team in July 1962, which had been signed by all the team members, including yourself. I kept this item until fairly recently, when I was clearing out the loft at my former property in New Ross, County Wexford, Republic of Ireland, prior to returning to this country in July 2008. I wish that I had kept it, as it would have made an interesting item for inclusion on this website. Talking of which, ye should also see my pieces on such diverse topics as Little Furze Primary School, South Oxhey Playing Fields, Early Memories, Mystery Chasm in Oxhey (Village), Golf, Hallowes Crescent Shops…..as well as Clarendon, that is!